The Galeries Lafayette should definitely be included on one’s list of things to see while in Paris, France. Located in the 9th arrondissement of Paris, Galeries Lafayette is a massive high end department store consisting of three buildings. Galeries Lafayette was started up in 1895, when cousins Theophile Bader and Alphonse Kahn decided to open a fashion shop located on the corner of rue La Fayette and the Chaussee d’Antin. As the shop prospered, the cousins expanded their enterprise and purchased the entire building on La Fayette that housed the store. 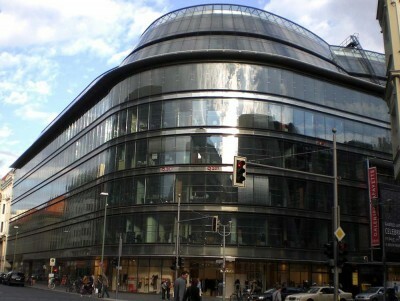 A few years later, the nearby building on Chaussee d’Antin was purchased as well. With a vision for a finished building that personified the Paris sense of style, a team of architects was commissioned to design the converged buildings. A signature glass and steel dome was erected, and the famous Art Nouveau stairways were added. The entire structure was completed in 1912. Considered to be the main building, Lafayette Coupole showcases the latest designer fashions for the young and trendy, as well as children. In addition to apparel, there are other items to delight the eye, including jewelry, cosmetics, and accessories. For those who are seeking the latest in electronics, music, and books, they will find it all in this building as well. Couples planning a wedding can go to the Marriage Boutique that displays the latest styles and fashions. After shopping, a relaxing break can be had at the restaurant which is located on the top floor. The restaurant has a beautiful terrace with a stunning view of the store below. From the Coupole, a covered walkway can be taken to this building which is famous for designer men’s wear in the latest styles. An impressive assortment of men’s fashion accessories may be found here as well, along with a delectable gourmet shop, The Lafayette Gourmet. The third building, which is located across the street from the other two buildings, is the Lafayette Maison, which showcases the latest in beautiful and stylish home furnishings. In addition to the normal displays of furniture that one would expect to see, there are also unique items of home décor and accessories that add the perfect touch to a designer home. Galeries Lafayette is more than just a gorgeous store with the latest fashions. It is an enterprise that is committed to keeping up with fashion trends and conveying them to their customers in an atmosphere of elegance. If possible, visitors should make arrangements to attend the weekly fashion show that is held each Friday afternoon at 3:00 p.m. and lasts for 30 minutes. There are no admittance fees for this show, but they do ask those planning to attend to secure a reservation beforehand. Visitors who have experienced the Galeries Lafayette commonly advise others to make a trip to the area.